Governor Nyesom Wike of Rivers State has inaugurated a judicial panel to investigate the administration of his predecessor, Chibuike Amaechi. The panel was inaugurated Friday in Port Harcourt, the state capital. Mr. Wike, a former member of the Amaechi administration who later fell out with his boss, has accused Mr. Amaechi and other officials of that government of stealing properties belonging to the government. He has vowed to recover them. 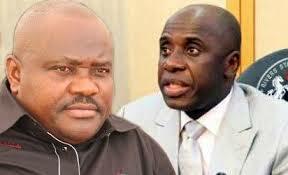 Mr. Amaechi denies the allegation, and says the governor’s mission is to tarnish his image. On Thursday, state agents said they recovered a vehicle belonging to the government from a former Commissioner for Information, Ibim Semenitari. Mr. Semenitari claims ownership of the vehicle. She said the car was allocated to her as part of the government’s monetization policy.